That's what I decided last week... Then, last Saturday, in the snow, I was out all day, up to Westchester, and didn't get any sewing done! Friday I cut out the makings of a denim skirt—a cute 8 gore one with a kicky little ruffled hem—not too full a ruffle—just a bit of interesting edge. What was I thinking? Denim, as everyone—even non sewers-- knows—Ravels.. (or does it unravel?) The raveling property of the fabric is what makes cut off's, and other unfinished edges look—interesting. Commercial clothing made from denim has flat felled seams—again you don't have to know much about sewing to recognize the special seam found on jeans –even if you never knew the name for that kind of a seam. Flat felled seams encase the edges and keep the denim from unraveling. But they are a real PITA to do at home. And I just don't do them. But—I needed to do something—or the inside of my denim skirt would unravel until the seams opened! So— I did what classicly is done (in home sewing) —I zig-zagged over the edges before sewing the seams. Now remember the part where I says 8 gores? That's 16 edges to over sew. Remember the part where I said it had a kicky little ruffle? Another 16 edges to sew.. plus another 16 top and bottom edges on the gores, and another 16 top and bottom edges on the ruffles. That's is a whole bunch of sewing—with out putting any of the parts together! I used an entire spool of thread (and the skirt still isn't all together!) --I still have a waist band to edge, and pockets to edge, (2 front ones, and 2 back ones)and side seams to sew up and zipper to put in! So while I spend several hours sewing yesterday, I don't have a skirt—yet! The bare bones are there (there is a front of 4 gores, and a back of 4 more gores—each with a bit of fancy top stitching)—but there aren't pockets (they haven't even been edged!) or side seams —and there is no waist band and no zipper, no belt loops, or tabs. The few seams that did get sewn, did get pressed. Lot's of sewing got done—but there isn't a skirt! I don't think I am going to wait till next Saturday to finish the skirt--but not I won't be working on it today. After dinner, I went back to knitting my scarf—and LOOK—another row (or two!) of diamonds. It's now 7 inches long (14—total!) 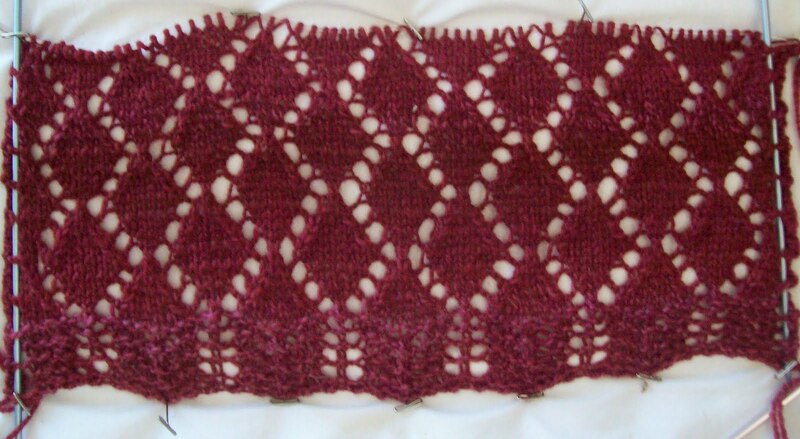 It's not a scarf yet either, but something got done—even if I don't have anything finished!